Experienced marketers know that attending a trade show is the equivalent of picking the low-lying fruit of the customer tree. By having a display that is eye-catching and attractive, trade shows allow the rare chance for company representatives to talk to potential clients directly. This kind of interaction usually only occurs at trade shows or professional networking events, which means each interaction should be treated as a possible sale. Generating sales doesn’t always come from cheap logo mounted stress balls or keychain lanyards, instead of finding the right leads needs to be seamless and flow as smoothly as possible, especially considering all the costs associated with trade shows. Trade shows are designed to help businesses expand the development of their brands and products, all the while creating a measurable ROI. Here are three general topics that will help you develop the right leads at trade shows and get the most out of your trade show budget. From even the very first time your organization is thinking about attending an event or trade-show, don’t go into it blindly with an exploratory, "let’s just see what happens" mindset. Instead, have a plan for every step of the way, from the very early stages to the post engagement of leads after the show. Start by creating a plan to select the right convention, trade shows, or conference. Typically, exhibiting at a trade show is not easy on the budget- there are many fees associated with exhibitors such as flights, hotels, meals, and the actual cost to fabricate and transport the booth or exhibit to the show. These costs can definitely start to add up, so a company must decide which trade show or convention would benefit them the most by determining, what is the right location? will the show attract the right people? and ultimately will it generate the right leads? A lot of trade shows provide promotional information about the kind of people who attend, as well as what most of them are there for and attendance numbers in years past. DO YOUR RESEARCH. When a company decides to reserve a booth at a conference or trade show they should start conjuring up business goals that establish a lead generation arrangement, prior to the actual event. Establishing goals are created by assessing how your company measures success. It could be by increasing leads, increasing sales, finding investors, receiving the right product feedback, or even just generating a goal number of qualified leads. It can be as simple as having a goal to rank each lead by either A, B, C, or D depending on how qualified as a lead they are. These little goals and little objectives can help your company achieve what your definition of success may be. No matter what your goals are they need to follow the S.M.A.R.T. goal setting outline when being created and planned out. Your goals need to be Specific: don’t just have a vague goal set, otherwise, you’ll have a hard time staying motivated. Goals need to be clear and concise. When planning goals they also need to be Measurable: how easy is it to measure your goals so you can effectively track progress? Having measurable goals allows you to track progress, which ultimately helps you stay focused and meet deadlines. Goals should be Attainable: your goals don’t need to be unrealistic, even if they are just small goals that help you reach the ultimate goal. Goals must be Relevant: your goals must be worthwhile. Ask yourself, "Does this match our other efforts/ needs, when it comes to developing our business overall?" Finally, Goals must be Timely: this part of the S.M.A.R.T. criteria allows you to easily decipher everyday tasks from long-term ultimate goals. Timely goals answer questions like, "What can I do today?" and "where do I want to see this goal six months from now?" As an exhibitor, you need to give some serious thought to how you will represent your brand in front of potential customers and competitors. When maintaining an image at a trade show or an event, you need to refer to your lead generation plan because that will help you decide what to offer and how to present your company or product. You want to be able to attract the right buyers, while still identifying the time wasters. Your exhibit or booth should be beautiful, but simple. 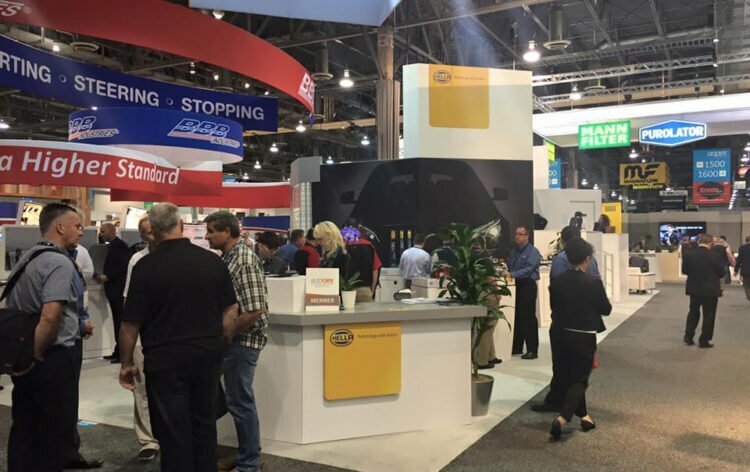 Your signage, booth design, and wordage are crucial factors for having an attractive booth and creating desirable value for your attendees. Your booth should encompass attractive aspects of design while making it generously clear what it is, exactly what your companies do or what they offer. Some of the best booths aren’t the flashiest or the most technologically advanced, but instead, the best booth is the booth that best fit the company’s respective brand and the message they want to communicate to their potential clients. If you are not confident about your display design you should consult with a custom trade show display manufacturer. Companies that sell stock trade show displays are generally not in the creative business. A custom manufacturer has the wealth of experience you need to make a big splash at events. You don’t need to kill your entire budget on your booth just to look attractive and professional. Sometimes, having the right image and professionalism can be achieved with a basic, dependably designed pop-up banner and some nice promotional swag. It can be as easy as renting stools instead of chairs so your booth representatives can sit between meetings without looking like they have the slumped stature of unprofessionalism associated with sitting in a chair. Additionally, the size or image of your booth may depend on the long-term effect of your trade show activity, and maybe not the image you are trying to portray. For example, a company that attends a large number of trade shows annually may want a smaller more portable display, while a company that attends only three trade shows annually may want a bigger booth, so they have a better chance of attracting more leads since those are the only three shows they attend. Finding this happy medium between budget and design can be challenging, but very rewarding if you know just how to attract your desired buyer persona. Consider handing out SWAG or free promotional items. These items can be as simple as pencils or lanyards, but still, do a great job of getting your brand name out there. Companies must closely consider their lead generation plans when considering freebies, because it may attract crowds to gather at your booth, but are they the right crowds? Make sure to be savvy with the amount of time allocated and don’t dwell on small talk, instead build rapport and move right on to the point of discussion. Spend quality one-on-one time determining if each individual is a real lead. Finally, use trade shows or conventions as a way to establish your company as an expert in a specific niche or industry. Often companies are asked to be on expert panels or speak at expert forums at trade shows. If these opportunities ever arise, take full advantage because it will give you credibility in your industry. It seems that as quickly as they come, they are gone. While trade shows only last a few days, the excitement during those few days is hardly contained. It’s important to keep up with the leads and relationships you make post-event because it is not often that you will make a large sale at the trade show itself. Remember though, all those business cards and phone numbers you collect are useless if you do nothing with them. Refer back to your lead retention plan, if you assign your leads at A, B, C, & D then you should take you’re A class qualified leads and follow up with them via phone call or email one day after the show. Assign reasonable time frames of follow up to the rest of your leads based on how qualified they are. A good plan that a lot of salespeople and marketer use has a follow-up email drafted before the show, that way you can make adjustments with it that are specific to each qualified lead that you meet. Having the right follow up technique and resources can be a surefire way to move leads along the sales pipeline. After following up with your leads, compare what you’ve accomplished and what you’ve done to your original goals. A basic way to measure progress is to view the quality leads you’ve generated versus the cost of the trade show to your business. If you measure progress successfully you can figure out which trade shows could benefit your organization the most.